There is a new trend sweeping through offices and break rooms across the country that is giving the water cooler a run for its money as the favorite social gathering place – cold brew coffee on tap! Managers are finding that less time is wasted on runs to the local coffee shop and employees are loving the quick access to the caffeine they need to get them going. It’s a win-win! 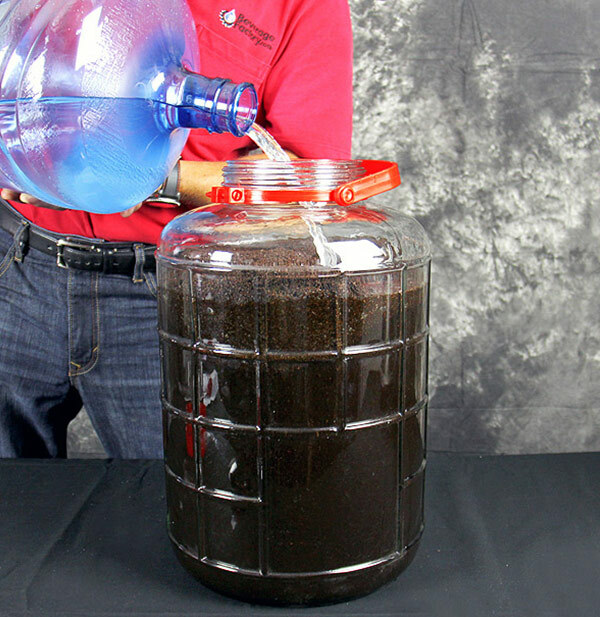 Many coffee shops are picking up on this trend and offering their coffee in 5-gallon kegs, but you can make it yourself if you’d like more control over the flavors and the finished result. The brewing process is very easy and doesn’t require a lot of fancy equipment. We’ve narrowed our favorite method down and listed it here for you. 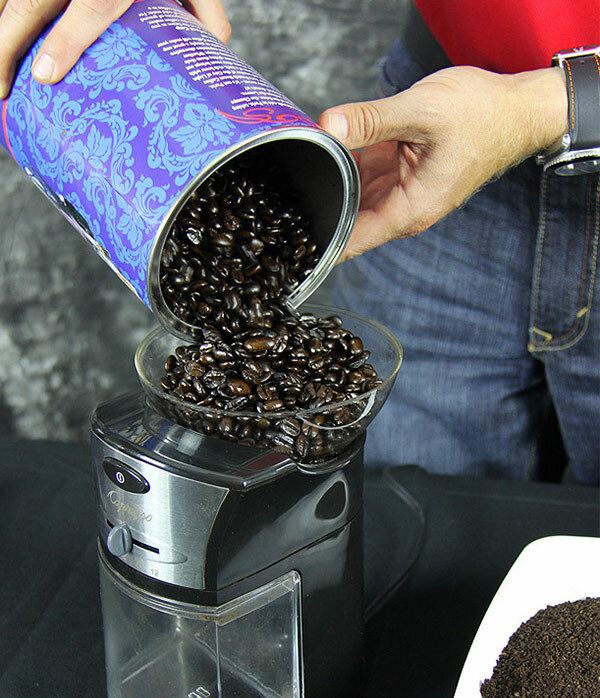 Grinder but you can also use pre-ground coffee. 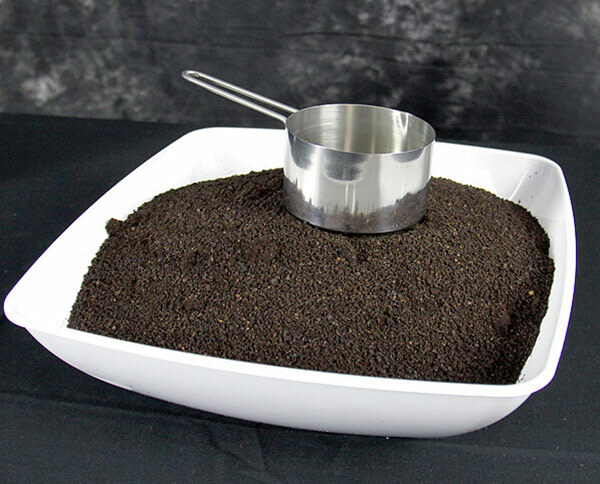 Since the volume of beans and grinds can vary, we recommend that you grind the beans first and then measure out the coffee for the recipe. 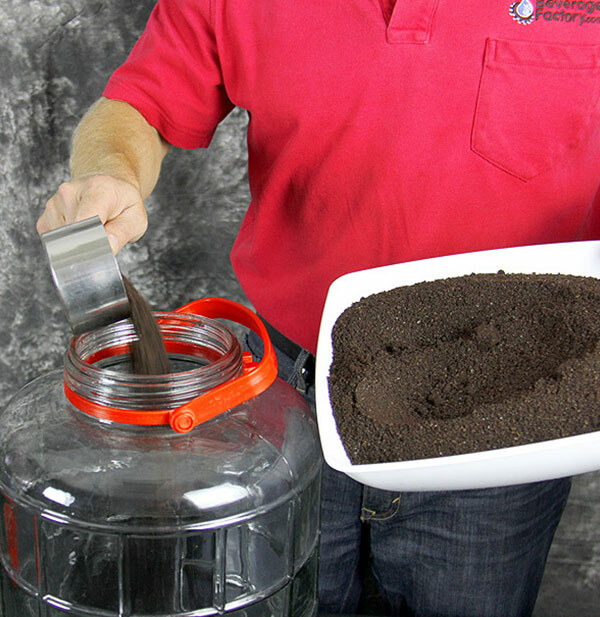 Add 15 cups of the coffee grounds to a large jar. 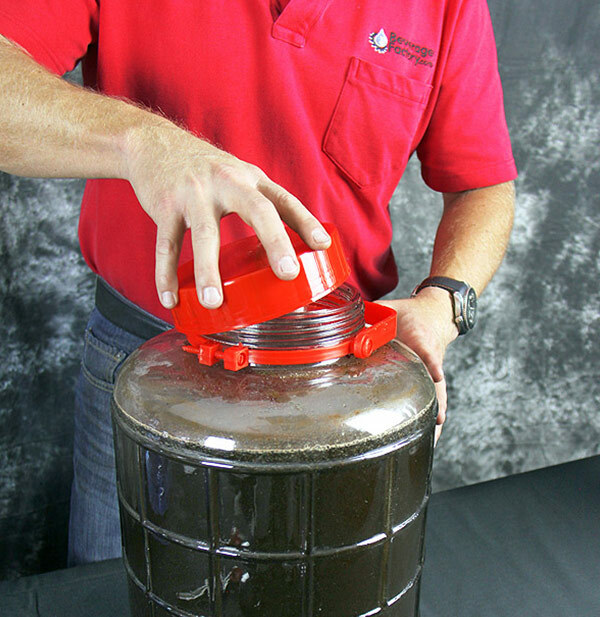 We used the Kegco Wide Mouth Glass Carboy, which worked perfect for our needs as it allowed us to make a large batch but still have room to mix it all together and clean it out easily when done. It has a 4.75 Gallon capacity and the top groove marks 4.25 Gallons, which allowed us to add the 68 cups of water and left room for the coffee grounds as well. Make sure to soak all of the grounds thoroughly. To make sure all the grounds are wet, use a long spoon to stir and mix your brew. We offer a selection of stirring spoons to suit this need. Replace the cap on the jar and let it brew. It can be left on the counter at room temperature or it can brew in the fridge. Let it steep for 12 to 18 hours. There is no need for additional stirring at this point. 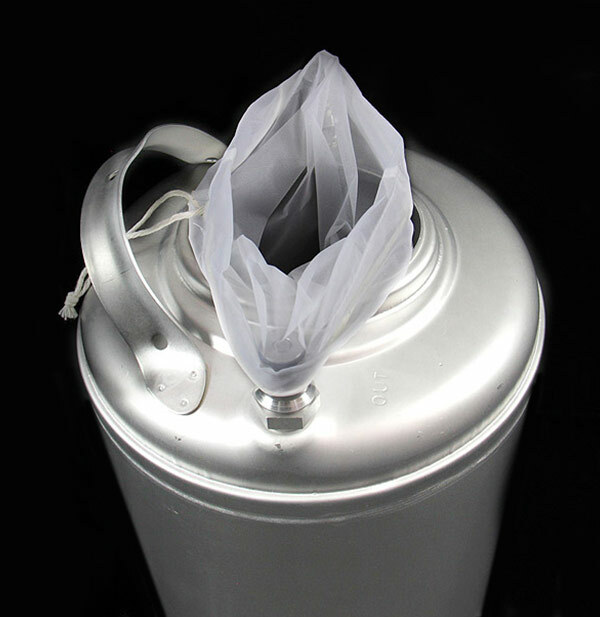 Nylon Hop Bag which easily covered the opening of the homebrew keg. If you’re feeling strong and don’t mind making a mess, you could just pour the contents of the jar through the hop bag and into the keg, but we used a 3/8″ Auto Siphon to transfer half of the brew and then poured the last half after the majority of the weight was out of the jar. The shoulder of the jar does a good job of trapping most of the grounds from coming out with the coffee and the hop bag caught the rest. It would be a good idea to have a bucket or trash can handy if you find that you need to empty the hop bag more than once. We didn’t need to. This mixture is considered a concentrate, so it will be very strong and some folks may want to water it down a bit. We liked it though and felt that adding water just made it taste like watered down coffee. Feel free to experiment with different flavors and solutions to find the taste you like best. Step 5: Dispense and enjoy! 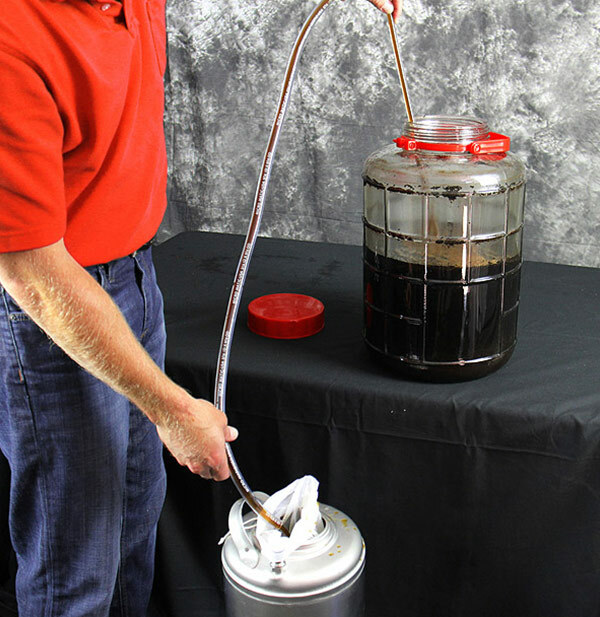 Now that you have your cold brewed coffee in a keg, it’s time to dispense it. 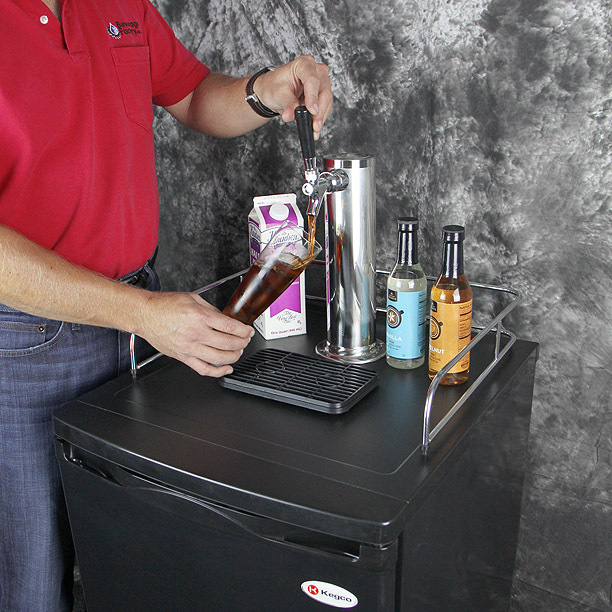 Kegco has introduced the Javarator, a mobile, easy-to-use cold brew coffee dispenser that makes having iced coffee on tap at home or the office not only possible but affordable as well. 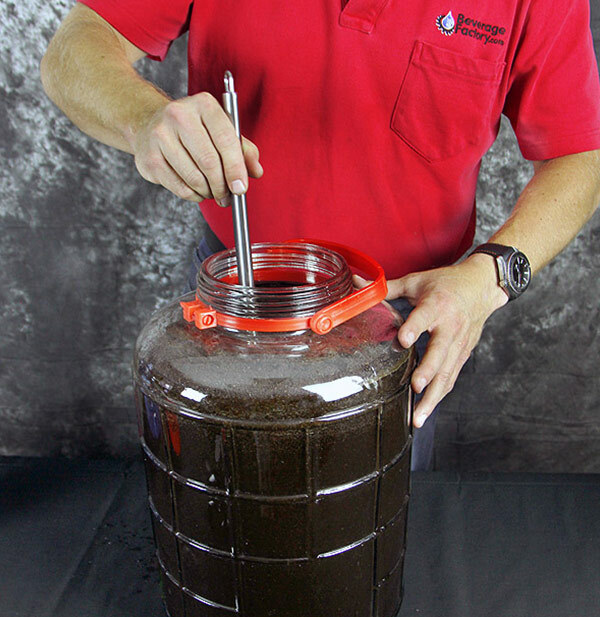 The Javarator comes with all stainless steel draft components and is equipped with a nitrogen tank, ensuring that you get a smooth finished product. Nitrogen is preferred over CO2 for serving coffee on tap because nitrogen is far less soluble than CO2. Any liquid that remains under pressure from CO2 for too long will eventually begin to carbonate, making the finished product fizzy and bubbly. Using nitrogen at low pressure will allow your coffee to remain as it was brewed and keep it fresh for up to a month because a pressurized keg does not allow oxygen to touch the coffee. 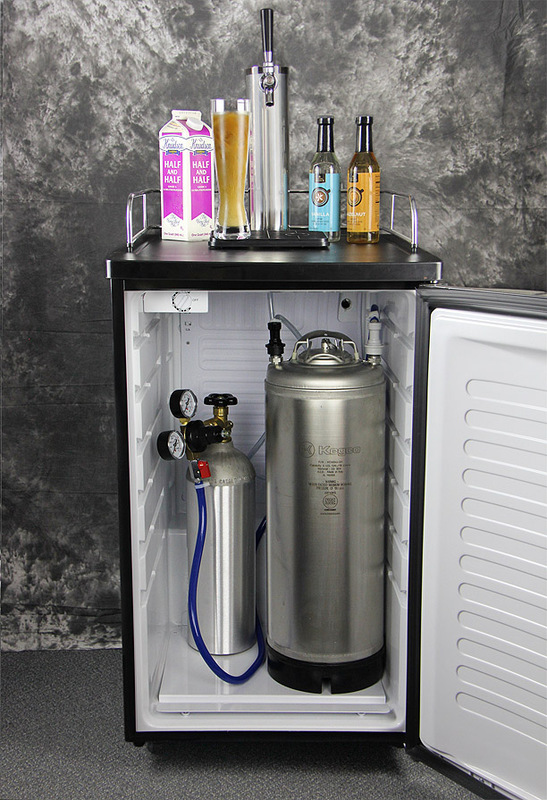 Just install your keg in the Javarator, hook it up to the dispensing system with the ball lock keg couplers that are provided, set the output pressure on the regulator to 3-6 PSI and pour yourself a glass! Coffee & Tea Coffee, Cold Brew, How-To. permalink. Thank You for this article! I can’t wait to try it! You’re welcome Curt, enjoy your brew!